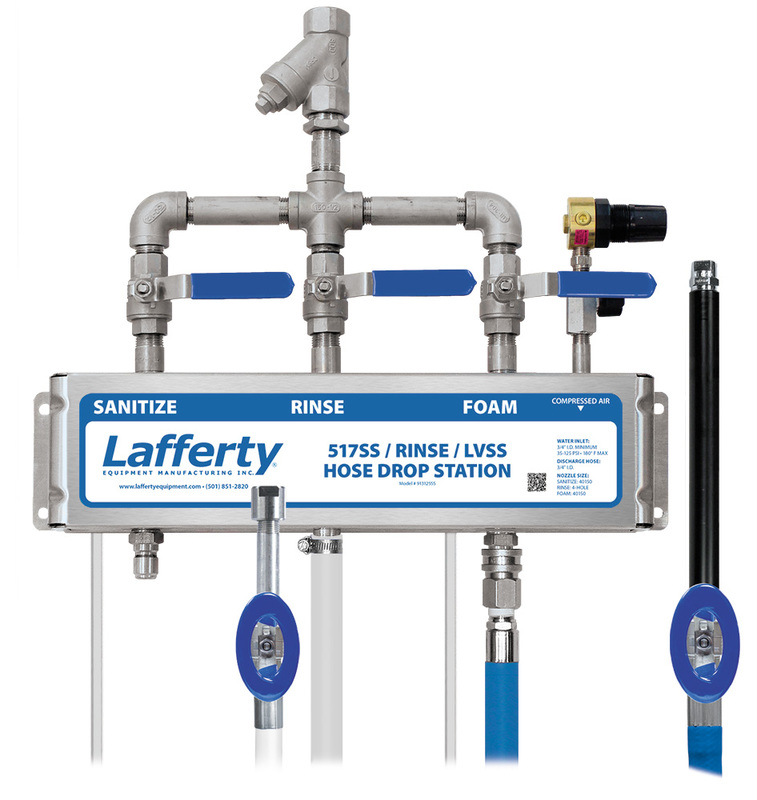 517SS Sanitize / Rinse / LVSS Foam Hose Drop Station | Lafferty Equipment Manufacturing, Inc. The 517SS Sanitize/Rinse/LVSS Foam Hose Drop Station is a combination applicator for applying one chemical as a low volume of foam, another as a sanitizing spray and for rinsing. This stainless steel venturi injection system uses standard city water pressure (35 - 125 PSI) to draw and blend chemical concentrates into the water streams to create accurately diluted solutions using precision metering tips to control chemical usage. A low volume of rich, clinging foam is created by injecting compressed air into the foaming solution to greatly increase volume and coverage ability. The foaming solution is then projected through the foam hose and fan nozzle at distances up to 9 feet. The sanitizer solution is projected as a "flooding" spray for fast complete coverage. Rinse at full pressure using the unique, powerful 4-hole nozzle. Sanitizer is projected as a "flooding spray"